Sally DeIuliis and her son, Emmerson, fed their neighbor’s horses in Black Jack on April 15. DeIuliis was six months pregnant with Emmerson and addicted to heroin when she received help from Catholic Charities’ Queen of Peace Center and the WISH Clinic at SSM St. Mary’s Hospital. Sally DeIuliis walked through the doors of Queen of Peace Center June 19, 2015, six months pregnant. She’d just been kicked out of a homeless shelter. DeIuliis had tried to get clean before, even paying for methadone — a drug used to help withdrawal — from a clinic. She switched to a free clinic, didn’t realize the strength of the dose was many times lower, and the baby almost died during severe withdrawal symptoms. 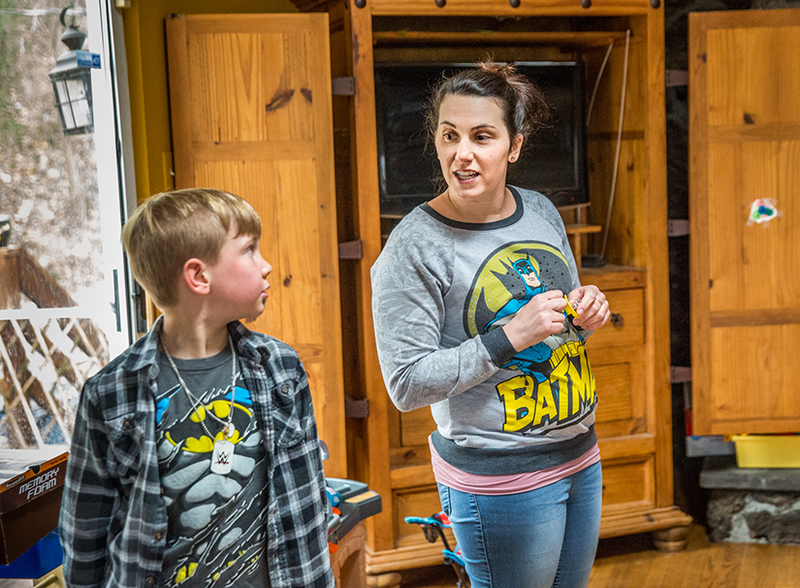 Sally DeIuliis talked to her nephew, Landon, as they both wore Batman shirts on April 15. “Sunday is Batman day,” explained DeIuliis. After receiving help from Queen of Peace Center and the WISH Clinic with a drug addiction, DeIuliis is sharing her story because she knows people need to see the personal side of the transformation that is possible with their help. At Queen of Peace Center she was connected with the WISH Center at SSM Health St. Mary’s Hospital and began supervised withdrawal process, a key piece to the healthy birth of her baby. Though she chose to live with her parents who were caring for her two boys, she came every day to Queen of Peace Center to take advantage of the holistic approach offered by the center. It offers a variety of treatment options, permanent and transitional housing for women and their families and an early-intervention and prevention program for adolescents. Queen of Peace Center, an example of the Catholic Charities agencies that receive funding from the Annual Catholic Appeal, is innovative because it allows women to bring their children with them, and the children receive treatment as well from counselors who specialize in treating children. “That is huge, because addiction is a family disease that affects so many areas of life. It’s as much of a recovery process for them as it is for me,” DeIuliis said. She attended Mass and prayer services at the chapel at the center, and her baby, now age 2, was baptized there. She also has guardianship of her nephew, age 7, and cares for another nephew, 9. 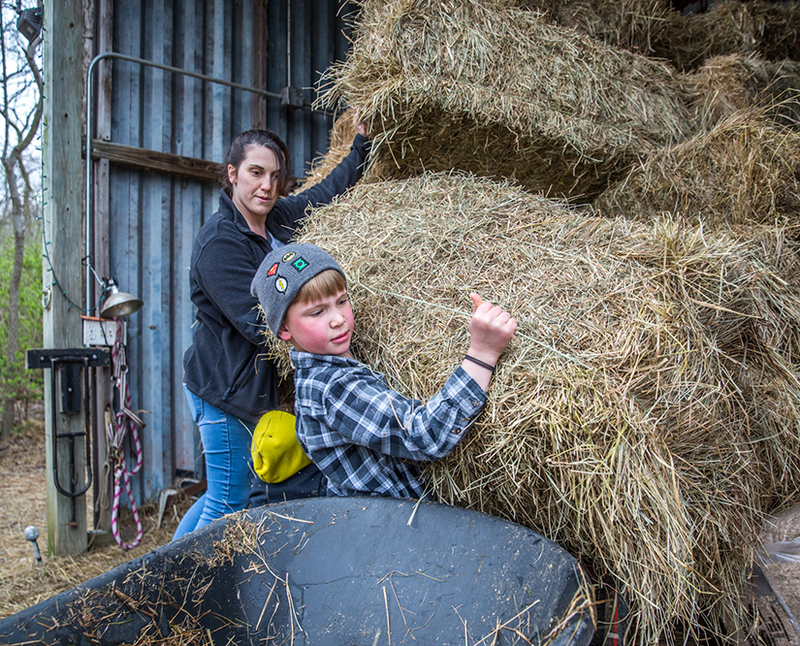 Seven-year-old Landon DeIuliis-Adams wrestled a bale of hay into a wheelbarrow to feed horses with his aunt, Sally DeIuliis, who takes care of him, his brother, and DeIuliis’ son, Emmerson. A graduate of Catholic schools, DeIuliis has an undergraduate degree in social work and criminal justice. She tried heroin once when feeling depressed and within weeks was using it daily, eventually shooting it into her veins, a $200 a day habit. It was five years before she ended up at Queen of Peace Center. She’s more than willing to be a spokesperson for Catholic Charities and Queen of Peace Center because she knows people need to see the personal side of the transformation that is possible with their help. Two years ago, she said, she wouldn’t look at her image in the mirror, so broken and ashamed of herself. She returned to school to become a certified nursing assistant, has a job, is involved in her children’s schoolwork and busy taking them to swimming lessons and sports practices. “I used to think I had to be perfect. When I realized I wasn’t, my world broke,” DeIuliis said. One big help is knowing “God is on my side,” she said. It’s also a justice issue, she said, because many people don’t have the resources to afford treatment. All of the money raised each year through the Annual Catholic Appeal is distributed to the various programs, parishes, organizations and ministries that carry out the important work of the Church. More information on and how to contribute to the 2018 Annual Catholic Appeal is available at archstl.org/aca.